For the three or four of you who are chomping at the bit for What Things Are Made Of to come out, here’s a quick update. It’s almost done. 92,000 words, about 320 pages laid out as a 6x9 paperback. I still have to complete the references, index, and one annoying section in Chapter 7. Then I have to evaluate print-on-demand shops and figure out e-pub formats and make some decisions. I’m anticipating January or February 2011 for an availability date. Thanks for the interest and support! And we’re back… it was a busy and complicated summer and I’ve spent a LOT of time actually working on and thinking about What Things Are Made Of. The book is now at just over 80,000 words, with 8 chapters finished (two need some expansion and tweaking, and a summary chapter yet to complete). I'm looking at print-on-demand and E-book for actual publication. I learned an interesting tidbit about manganese, a metal the U.S. uses mostly in steel alloys and imports at a rate of 100%. Our primary supplier is little Gabon, with 57% of our manganese ore imports. Gabon’s manganese is associated with a pretty cool location – the only natural nuclear reactor known on earth. A little over two billion years ago fissionable uranium isotope U235 was more abundant in uranium deposits, at nearly three percent, than it can be today simply because over those two billion years most of it has decayed to lead. Evidently critical mass was reached in a uranium deposit back then, and nuclear reactions happened. It’s not perfectly clear why the manganese is associated, but it’s enough to make manganese Gabon’s second most valuable export. $100,000,000 worth came to the US in 2009 – but that pales in comparison to Gabon’s oil exports to the US, valued at $2,200,000,000, twenty-two times the manganese value. Manganese steel is critical in construction, so the late 2000s recession has taken a toll. US manganese consumption in 2009 was a third of its use in 2006, but it is still a half-billion-dollar business in the United States. Like gunpowder, fireworks are mostly sulfur, saltpeter and carbon but with diverse agents added for color. They originated in China about 1000 years ago as a variation on black powder. 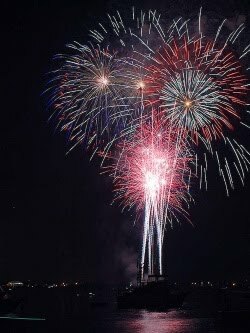 April 18 commemorates the invention of firecrackers by Li Tian, a Chinese monk who lived near Liu Yang in Hunan Province, the region that supplies most of the world’s fireworks to this day. Strontium carbonate (red) and barium chloride (green) tint modern skyrockets and other fireworks. Lighter red may come from lithium carbonate with orange provided by calcium chloride. Blues usually indicate the presence of copper compounds, which also produce purple when mixed with strontium. Rarely, rubidium generates purple. Sodium makes yellow, iron makes gold. Burning titanium, aluminum, or magnesium metal powder is the basis for intense white or silver stars. Strontium also makes red color in highway flares. My apologies for no posts. I’ve been busy doing walking tours, driving the Butte Chamber trolley, and working on a booklet and exhibit for artifacts from the 2007 Butte Chinatown archaeological dig. The dig unearthed pieces of opium pipes, some of which are earthenware and some are stoneware. Today’s post focuses on differences in those two types of ceramic. Both earthenware and stoneware are essentially fired clay, though proportions of components vary widely. Stoneware is usually fired at higher temperatures (up to 1300º C vs. temperatures more in the range of 1000º C for earthenware), which gives it a denser, more vitreous texture. At the heart of such ceramics are clays—fine-grained sheet silicates similar to mica. Their structures can incorporate water, and when fired, such clays effectively collapse into denser structures, or even metamorphose (change form) into other, denser minerals. Ball clay, so named because historically 35-pound cubes of clay became rounded during shipping, is a common constituent. It is usually mixed with varying amounts of kaolin (another clay mineral), quartz, and feldspar to make ceramics. In the United States, Pennsylvania was a historical major producer of ball clays. In Europe, Devonshire, England was an important source. Today, 63% of U.S. ball clay production comes from Tennessee. Ceramic earthenware and stoneware such as dishes and bowls is a tiny volume of all clay consumed. Most ball clay in the U.S. serves as fillers and plasticizers in floor and wall tiles, and in the ceramics that become toilets and sinks. The clay industry in the United States is a $1.4-billion business employing about 5400 workers in 41 states. 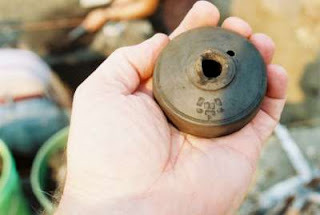 Photo of opium pipe from Butte Chinatown archaeological dig courtesy of Mitzi Rossillon. Current (late May 2010) estimates of the rate of leakage in the Gulf of Mexico well are 12,000 to 19,000 barrels a day. Pretty bad, and significantly worse than early estimates. 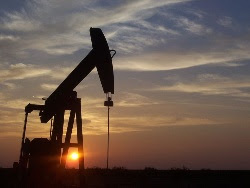 With total U.S. oil consumption at 19,714,000 barrels a day (May 21, 2010), the leak at 15,000 barrels per day would take 1,314 days (more than 3½ years) to equal one single day of U.S. oil consumption. The point is not to belittle the disaster—it's an awful thing—but rather to point out the gargantuan scale of U.S. oil consumption. In the wake of the disastrous oil leak in the Gulf of Mexico, visitation to my website’s oil pages has spiked to over 1000 unique visitors a day, as it does when the price goes up or hurricanes or wars interrupt our guzzling. There is plenty of information out there, so I see no need for me to expound on much about the problem. But I need to address one issue, the demand from some that we put an end to offshore drilling and production because it is so dangerous. I’m as much or more of an “environmentalist” as many are. Most geologists are, because they love the earth. That does not mean we reject the value of earth products, whether oil or copper or neodymium. But those who would eliminate offshore oil exploration and production need to realize one thing. More than a third (37% in December 2009) of U.S. domestic oil production comes from offshore wells. Federal offshore areas (mostly in the Gulf of Mexico) produce more oil than any state. More than Texas, more than Louisiana, more than Alaska. More than 2,000,000 barrels a day in December 2009. Shut it off – and replace it how? There is no replacement source that can be tapped economically, if at all. By the time any new discoveries come onstream, in seven to 15 years from now, existing production will have declined by that much or more: we will only maintain the status quo if (IF) we discover and develop that much production. The only significant possible locations for those high-volume discoveries are offshore, and there is no guarantee that it exists at all. 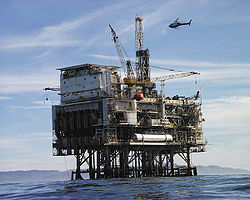 Public domain image of offshore platform. Credit: NASA. Last night I went to a Butte history talk focusing on home furnishings about 1910. Among the multitude of state-of-the-art items anyone could buy at Butte’s Hennessey’s store using the newly invented time payment plan (a.k.a. credit) was linoleum flooring. Invented in England in the late 1850s, linoleum's basis was solidified linseed oil derived from flax plants. It gave a tough but flexible material. Minerals extend and improve the properties: finely ground limestone or whiting may comprise a third of linoleum’s volume while clays add flexibility and also serve as extenders or fillers. Various other additives—sawdust, gum, pine rosin—also help give linoleum its desirable properties. An unusual mineral, wollastonite, calcium silicate, crystallizes as tiny elongate needles or blades. This geometry helps bind other materials together, and as tough little bars, wollastonite makes linoleum stronger while maintaining its flexibility. It’s a chemically stable mineral that helps linoleum resist chemical attack and cracking over a wider temperature range than wollastonite-free material. Although wollastonite deposits were exploited in Inyo, Kern, and Riverside Counties, California, from 1930 to 1970, the largest wollastonite mines in the U.S. are in Essex County, New York, in billion-year-old rocks of the Adirondack Mountains. The ore is processed at Willsboro, and together with another mine in Lewis County makes wollastonite New York’s fifth most valuable non-fuel mineral product. Almost all U.S. wollastonite production today comes from New York, adding up to about a quarter of all produced in the world. That ranks the U.S. at #3 for wollastonite, following China and India which together account for about 70% of world production. Thanks to the New York mines, the U.S. is largely self-sufficient in wollastonite production, with something like 5% of consumption imported. India is the leading source of those imports, but China, Canada, Germany, Finland, Japan, and France also ship small volumes to the U.S.
Wollastonite finds its way into ceramics, metallurgy, paint, plastics, caulking compounds, friction products such as auto clutches and brakes, and synthetic rubber including auto tires. Much “linoleum” today is really polyvinyl chloride, made from natural gas and salt. Although Frederick Walton patented his linoleum-making process in 1860, he failed to trademark the name and lost lawsuits alleging others who used the word infringed on his trademark. Consequently, “linoleum” is considered the first product name to evolve into a generic term—and it happened just 14 years after its introduction. Wollastonite specimen image from U.S. Geological Survey via Wikipedia. Say – can you see? An alchemist’s cabinet could have been the resource for modern eyeglass manufacture. The lenses contain a wealth of trace elements to improve their optical properties, from lanthanum (a rare earth, most of it mined in China today) to improve the refractive index and reduce color dispersion, to silver chloride or silver bromide in photochromic lenses that darken when exposed to ultraviolet light (UV). Cerium, titanium, neodymium, and manganese in glass all help absorb harmful UV rays. Coloring and the non-reflective surface on sunglasses may contain erbium, one of the four rare-earth elements named for Ytterby, Sweden. As with most glass, the fundamental component is high-purity silica, SiO2 – quartz, the most common mineral in the earth’s crust. Plastic lenses are polycarbonate petroleum derivatives. Such plastics may also form the frames and earpieces, but the nose pads are softer plastic, often rubber-like silicones. Silicones are complex organic-silica compounds typically synthesized from methyl chloride (usually derived ultimately from natural gas or petroleum, and salt (NaCl) to give the chlorine) in the presence of copper as a catalyst. Metal frames, usually some alloy of steel, can include aluminum, magnesium, titanium, and other elements added for tensile strength, light weight, and other properties. Nickel or chromium coatings give varied appearances as well as corrosion protection. “Memory metal,” which springs back to its original shape after flexing, is one of several copper-zinc-aluminum-nickel or nickel-titanium alloys. The inventor of the first eyeglasses is unknown, but early Renaissance Italy, a hotbed of innovation, is the likely location where some lucky resident wore the first spectacles. Old manuscripts suggest that convex lenses – barely more than frame-mounted magnifying glasses – began to correct farsightedness in the late 1200s; not until 1451 did Nicholas of Cusa, a German Catholic bishop, learn how to use concave lenses to combat nearsightedness. Benjamin Franklin invented bifocals in 1784, and George Airy’s astigmatic lenses provided correction for the last of the major eye focusing problems in 1825, a decade before Airy was appointed Britain’s Astronomer Royal. George Airy (1801-1892) is better known (at least among geophysicists like me) for his determination of the earth’s mean density when he was only in his 20s. His pendulum experiments led to the Airy Hypothesis of isostasy, which says that mountain ranges must have root structures of lower density than the surrounding rock, proportional to their height. Image: The 'Glasses Apostle' in the altarpiece of the church of Bad Wildungen, Germany. 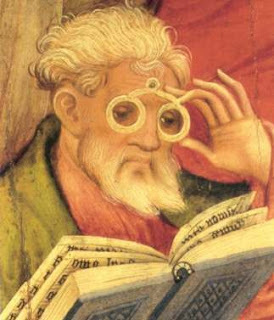 Painted by Conrad von Soest in 1403, the 'Glasses Apostle' is considered the oldest depiction of eyeglasses north of the Alps. Image in public domain via Wikipedia. You remember the game—you whisper something to your neighbor, who whispers to the next person and so on around the room, until something incredibly different gets back to you. I see the Internet as one big game of gossip. You’d think people could search around until they figured out the “truth,” whatever that may be. But it seems that many just latch onto the story of the moment, take a few highlights, add some embellishment, and pass it on. A simple example comes from the questions I get through the Oil Statistics pages of my web site. It’s astonishing how many people ask whether or not it’s true that all of Alaska’s oil is exported to the Far East. And more astonishing how many, after I point out the answer with reliable sources, tell me I have to be lying and that I’m part of the conspiracy. In 1996, when oil cost $12 a barrel and there was a glut of the stuff on the West Coast—refineries couldn’t handle it all—a law was passed allowing Alaskan oil to be exported. At a maximum of 7% of production. For four years, some oil was shipped to Japan, South Korea, and China. Only rarely was as much as 7% exported—the most was about 80,000 barrels per day when the US was consuming 19,000,000 barrels per day and Alaska was producing around 1,300,000 barrels per day. In 2000, with prices up and the glut in West Coast refineries relieved, the State of Alaska and oil companies voluntarily ceased the exports, and since then every drop of Alaskan crude has gone to US refineries. But you’d be amazed how many people flat-out will not believe that. More information and links are available on my Alaska Oil page. 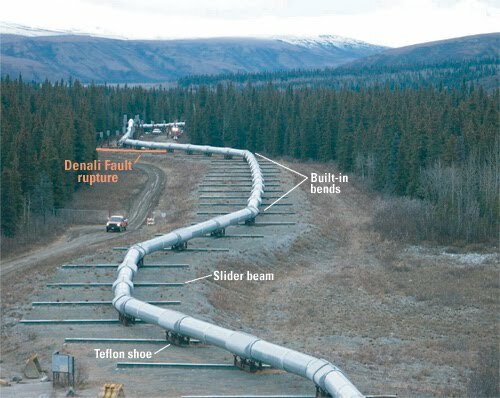 Alaska Pipeline photo from US Geological Survey. 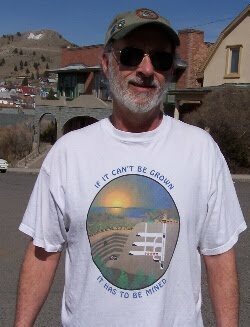 My t-shirt reads “If it can’t be grown, it has to be mined.” And while that’s a mantra of the mining industry, it’s also completely true. This particular shirt is 100% cotton, and “Hecho en Mexico.” For a future post, I’ll write about 50-50 blends of cotton and polyester, but for now I want to address the mineral underpinnings of this cotton, something that is grown. Even things that are grown require minerals. Think soil and fertilizer and pesticides. Yes, I know there is a small and growing movement toward “organic agriculture,” including cotton farming, but it is tiny compared to the industrial scale of most textile crops. World-wide, 25% of all chemical pesticides and fertilizers contribute to cotton’s growth. China is the world’s largest cotton grower, but the U.S. is the #1 cotton exporter. China is our #1 customer, with Turkey and Mexico next in line. Mexico relies on the US as its greatest supplier of cotton. So although my shirt is hecho (assembled, sewed) in Mexico, at least some of the cotton probably came from fields in Texas or California. Just as you can’t boycott Arab oil by boycotting any (and I really mean almost any) U.S. gas station, you can’t “buy American” simply by avoiding a product “made” elsewhere. Cotton farmers, potash miners, natural gas producers in the U.S. have all contributed to my “Made in Mexico” t-shirt. Ninety percent of the cost of nitrogen fertilizer is in the cost of the natural gas that becomes ammonia and ultimately the nitrogen component. Some comes from coal, but natural gas, mostly from the U.S., is the feedstock for most of it. Potash, another mineral vital in fertilizers (the source for potassium) is mined in New Mexico and extracted from brines in Utah and Michigan, adding up to a 686-million-dollar business employing more than 1,000 workers. But the U.S. fertilizer industry is so big we also import 73% of more than three million tons of potash each year. Most of it comes from Canada, but Belarus supplies about 5% of our potash imports. Pesticides have a well-deserved negative reputation. They are, after all, killers, and they have negatively impacted humans and beneficial animals and plants as well as pests. Whole books and advertising campaigns champion and condemn their value and their evil. For now, suffice it to say that they are ultimately made from chemicals derived from minerals, from oil and natural gas to arsenic and chlorine. And love them or hate them, they are used in agriculture on a huge scale world-wide. Farming of course requires other mineral-based equipment and supplies, from tractors and their fuel to water-supply systems. My primary point in this post is to highlight the extreme interdependency on a global scale of the things we take for granted. And to point out that a label like “Made in Mexico” or “Made in USA” isn’t a black-or-white statement. My t-shirt’s imprint boasts at least six colorful dyes. I’ve posted previously about the deep blue color ultramarine, and again the topic of mineral pigments fills more than one book. That’s enough for now. Photo by Lady von Gaga-Gaza. Does the US import everything? Not quite! It seems I’m always focused on the United States’ dependency on foreign imports for most everything, and to tell the truth, increasing that awareness is an important motivation for What Things Are Made Of. But what about the other way around? What raw mineral commodities does the U.S. export? Not too many, but U.S. mineral exports are important and valuable. The gold mining and milling industry employs nearly 10,000 workers in the U.S., mostly in Alaska and Nevada, yielding mine product worth about $6.4 billion. What about oil? Yes, the world’s largest consumer (18,520,000 barrels a day in January 2010) does export crude oil. 33,000 barrels (under two-tenths of one percent of consumption) every day in January. I hear the outrage: we need every drop, prices are too high already, companies are screwing us. But consider: all that exported crude goes to Canadian refineries, typically those nearer the producing fields than US refineries. And virtually every drop comes back to the U.S. as imported gasoline. It would in all likelihood cost more to ship the oil from a remote North Dakota field to a refinery in Texas than across the border to Canada. And to repeat something that needs repeating, not one drop of Alaska crude goes to the Far East or any nation other than the U.S. At most, from 1996-2000, 7% of Alaska’s crude was exported. Nearly half the U.S. output of soda ash is exported, half of a $1.4-billion-a-year industry centered on southwest Wyoming. A vital component of glass manufacture, soda ash also finds its way to soaps and many chemicals, but its role in glass makes the business sensitive to housing and automobile manufacture; consequently production dipped a bit in 2009. 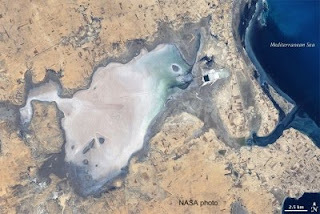 But the U.S. remains the 600-pound gorilla of soda ash, with 93% of the planet’s natural product yield and 96% of estimated world reserves, all thanks to an unusual deposit of the mineral trona, laid down in a huge Wyoming lake about 45,000,000 years ago. Other commodities that the U.S. exports include molybdenum, boron, helium, diatomite, and zirconium. 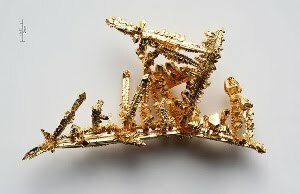 Gold crystals photo from Wikipedia, licensed under the Creative Commons Attribution-Share Alike 3.0 Germany license. Prices of mineral commodities, like those of most things, vary over time according to supply and demand and natural and geopolitcal events that artificially inflate or deflate prices. Tariffs and government regulations can impact prices too, as can market speculators. Copper’s price has been driven in recent decades mostly by the rate of building construction in the biggest consumers – the US for all of the 20th Century, and China since 2002. Half the copper used in the US goes to building construction. During the 1990s, copper’s average price for the year ranged from a high of $1.38/lb in 1995 to a low of 76¢ a pound in 1999. It remained below $1.00 per pound until 2004; in 2006, the price nearly doubled to an average of $3.15/lb and has remained above $3.00/lb on average every year since then (except 2009, at $2.37). Copper was near or above $4.00/lb briefly in 2006 and again in 2008. A general upward trend in 2010, to more than $3.50 now, may signify an improving economy – or at least a perception of one in the markets. Neodymium, critical in many applications but in rather low quantities, was around $6/kilogram (2.2 kg/lb) in 2003 but as demand increased (for magnets in electric motors for cars and windmills, among other things), the price reached $60/kg in 2007 and has been in the $40-$46 range since then. Indium, an important component of thin films in liquid crystal displays and flat-panel TVs and computer screens, ranged in average annual price from $120 to $375 per kilogram from 1991 to 2001, and reached a low in 2002 at $60/kilo. As technology improved and we began to buy more and more flat-panel products, indium’s price climbed dramatically in the 2000s — $176/kg in 2003, $643 (2004), $961 (2005), $815 (2006), $637 (2007), $519 (2008) and $390 in 2009 as economic problems reduced its consumption. In April 2010, indium was at about $625/kg. 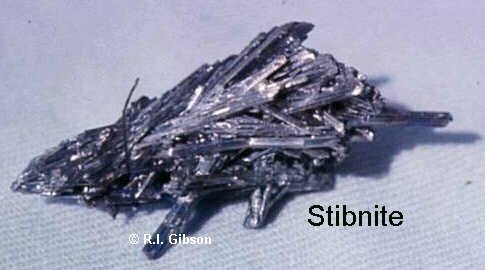 Indium is three times more abundant in the earth’s crust than silver, but it forms few minerals and almost never in economic concentrations. The 600 tons per year produced on earth come mostly as byproducts of zinc mining; half the world production comes from China. Even a common commodity like rock salt shows price fluctuations. From 1991 to 2003, its price hovered between $19/ton and $23/ton. Since 2004 the price has climbed steadily, to $35/ton in 2009. In the same time frame, US imports of salt nearly doubled, from 11% in 1991 to 20% in 2008-09. The biggest consumer of salt is the highway deicing business (43% of consumption), with the chemical industry in second place (35%). When you compare prices, be aware that different materials may be priced differently. It could be pure metal, or a metal oxide, or a metal concentrate that’s priced, but all under the heading of cobalt (or whatever). Image from Wikivisual under the terms of the GNU Free Documentation License. Coal has been in the news lately, with a deadly explosion in a West Virginia coal mine and a near-disaster at another mine in China. Leaving aside the dangers, both human and environmental, what is coal used for? Most people will be aware that about half the electricity in the U.S. is generated by burning coal (world-wide, the figure is about 40%). Burning coal has been used historically to create steam for locomotives, ships, and machinery, and as a direct fuel for heating homes and businesses. I’ll focus on more obscure, non-fuel uses. One use that is not really obscure, but involves burning coal, is steel manufacture. Coke, coal that has been baked to drive off volatiles, is the main fuel for steel blast furnaces. Diverse chemicals derive directly or indirectly from coal. Coal tars are residual by-products of coal gasification. Coal gas was used for city street lighting in the decades before electric lights became common. 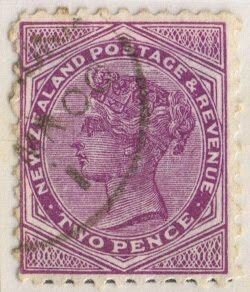 Coal tar chemicals led to the development of some insecticides, paint thinners, and moth balls, as well as mauve and other synthetic dyes (see Mauve: How One Man Invented a Color That Changed the World, by Simon Garfield, a good read) including the color in the 1882 stamp seen here. Coal tar chemicals yield both aspirin and the plastic bottle containing the medication. Fertilizer, smelling salts, and baking powder have a chemical heritage in the ammonia derived from the coking process. Soap, nylon, and synthetic rubber in car tires have coal-derived components. Activated charcoal filters, from air cleaners to kidney dialysis machines, are made from coal. TNT explosives and perfumes have coal in their pasts. The United States owns the greatest coal reserves in the world, at 27% of the total (Russia is #2 at 17%), but China is the world production leader with almost 40% (U.S. is #2 at 17%). China’s industrialization means it exports less and less coal, using most of it internally as the world’s largest coal consumer, with the consequence that Australia is the leading coal exporter, at about a third of the world total (and Indonesia is the #2 exporter, with 13%). If you’re like many Americans, you probably think your home and life represent marginally controlled pandemonium, sometimes verging on delirium. But if you operate a safe home, you may well have some useful pandemonium and not even know it. Pandemonium and delirium were the working names for radioactive Elements 95 and 96, synthesized in 1944 by Glenn Seaborg, Albert Ghiorso, and Ralph A. James during the Manhattan Project to unleash the power of the atom. Radioactive plutonium decays by emitting beta particles to form Element 95 – now called americium – and Element 96, curium. Americium, named for the Americas, occupies a tiny wafer in ionization-type smoke detectors. A fraction of a gram of radioactive americium metal, rolled with gold to form a thin foil, is sandwiched in a silver-palladium pellet. Alpha particles emitted by the americium are big and can’t travel very far. They ionize the air in a small chamber, and the ions set up a small current between two plates connected to a battery or electrical source. When smoke enters the chamber, the ions are attracted to smoke particles rather than the electrical terminals, so the current measured is less than normal. Once the current falls beneath a pre-set threshold, the smoke alarm goes off, and pandemonium follows. Most americium production comes from nuclear facilities, where it is a by-product of plutonium reactions. One such facility, Los Alamos National Lab, recently put out a call for commercial partners to work with them in marketing and distributing the element. 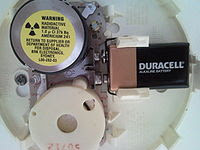 Radioactivity in your smoke detector is not dangerous. As noted above, the particles can’t travel beyond the chamber in which they form. It would not be a good idea to eat your smoke detector, however. Smoke detectors have been suggested by the paranoid as targets for terrorists who would use the americium to make nuclear explosives. There’s only about 0.00000029 gram in each smoke detector, and it takes around 80 kilograms to attain critical mass to explode, so it would take a LOT of smoke detectors – likely, most of those in existence, or more – to make an explosive. Don’t lose any sleep over it. Today I take my text from Charles B. Hunt, US Geological Survey geologist mapping the Henry Mountains in southern Utah in the 1950s. In the 1950s US Geological Survey publications were intensively reviewed for style and accuracy, so it’s a minor miracle that the definition got published. This was Hunt’s way of poking fun at the proliferation of –lith words for various rock bodies (the suffix derives from Greek lithos, stone). The definition has a cult following among geologists – I love to roll it off my tongue at parties, where people then stare at me with more than the usual concerned look – so much so that when it was removed from the Glossary of Geology, the hue and cry was such that it returned to future editions, where it remains to this day. All scientists, all specialists, have their own argot, jargon, and particular terminology that tends to exclude the uninitiated from their secret club. At this stage in my career, one important motivation for me to write What Things Are Made Of is to try to open those secret doors to give non-scientists a look at geoscience. Whether I succeed or not can be argued, but I am trying. Will I be the next Simon Winchester (The Map that Changed the World, Krakatoa) or John McPhee (Annals of the Former World)? I’d be the last to compare myself to them, but they give me a clear target for lucid writing to which I aspire. Early residents of Afghanistan mined the rock lapis lazuli more than 6,000 years ago for jewelry, including the famous gold mask of Tutankhamen. By the 6th Century AD they began to produce the deep blue pigment now known as ultramarine. They used it in cave paintings; its use spread to China and India, and eventually to Europe by about 1100 AD. Grinding the blue rock, mixing it with waxes and oils, and processing in a lye solution yielded natural ultramarine pigment. 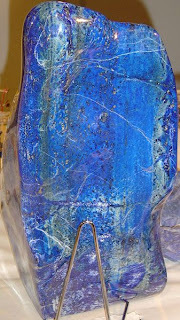 Lapis lazuli’s rarity made for notable expense (greater than gold) in making ultramarine pigment. In European monasteries, highest quality ultramarine was used only on the most important, prestigious artworks, for the robes of Mary and the Christ child. By the 1820s, a synthetic version was devised, and reliance on Afghan sources, the most significant in the world, waned. The rock lapis lazuli contains multiple minerals, with the blue color coming mostly from two complex sodium-calcium aluminosilicates, lazurite and sodalite. Even after synthetic dyes became the rage in the 1850s and 1860s, the natural material still served special purposes such as printing postage stamps. Stamp collectors who own blue-tinted U.S. postage stamps from the 1860s (such as the 3¢ ultramarine locomotive in the 1869 pictorial issue) probably have some microscopic bits of Afghan lapis lazuli. One of the most common search words used by people who end up here is neodymium, the rare-earth element critical to powerful magnets in applications such as electric cars, wind turbines, and MRI machines. So I decided to write a bit more about rare earths and their worldwide occurrence. Although rare earths are actually moderately common in the earth's crust, economic concentrations are indeed quire rare. The Bayan Obo deposit in northern China, about 100 km from the Mongolian border, is presently the most productive mine complex for all rare earths. China produces 97% of the world's rare earths. Two North American deposits have recently attracted attention, because Americans are increasingly aware of our use and dependency on China for these elements (averaging 91% of U.S. imports), and because the price for some of the 17 rare earths is approaching levels to make mining them here economic once again. The mine at Mountain Pass, in California’s Mojave Desert, was the largest rare-earth producer in the world until the 1990s when China took over. Molycorp, owner of the deposit there, has been processing accumulated ores for a couple years, although the mine itself has not reopened. And for final processing, they must ship their product to—you guessed it—China, the site of the only separation plant. Constructing one in the U.S. would be a huge investment, one nobody is presently willing to undertake. Another promising undeveloped rare-earth deposit lies along and adjacent to the Continental Divide between Montana and Idaho, centered on the Lemhi Pass area. Two sites are held by U.S. Rare Earths, Inc., a private company. The Idaho deposits were discovered and initially investigated in the late 1940s and 1950s because they held radioactive thorium, important in nuclear weapons development. The geologic setting is complex: igneous (formerly molten) rock bodies that were once thought to be part of the Idaho Batholith (around 100 million years ago, but with a wide range of dates) are now considered to be Mesoproterozoic (something like 1300 million years ago) in age, and to have metamorphosed (changed by heat and pressure) the surrounding rocks of somewhat older age. Sedimentary rocks of the Gunsight and Apple Creek Formations became quartzites and gneisses thanks to that metamorphic cooking. They also became the host rocks for the veins containing rare earths, gold, and other minerals. The whole area is complicated further by thrusting – faulting, breaking rocks, by pushing older layers up and over younger layers, sometimes on scales of tens of kilometers or more, something that probably happened over tens of millions of years around 60-70 million years ago. Then, about 40 or 50 million years ago, Nature put a pile of volcanic rocks on top of the whole mess. With all that going on, you can imagine that geologists are still working out the details, and what I write above is just a broad-brush overview. Some of the basic geologic mapping by U.S. Geological Survey, Idaho Geological Survey, and other scientists was published only a few years ago. It is not completely clear (at least not to me) when the valuable minerals came in—some indications say it was associated with the early metamorphic cooking, some suggest later. But the high grade of the ore at Lemhi Pass and near Salmon, Idaho, is clear, making the two sites perhaps the highest potential in the U.S. as undeveloped rare-earth resources. Exploration and economic evaluation is underway for two other isolated rare-earth deposits, one near Sundance, Wyoming, and one beneath 600 feet of rock in southeastern Nebraska. Another potentially important North American rare-earth deposit is being investigated at Thor Lake, north of Yellowknife, Northwest Territories, Canada. We’ll save these possibilities for another post. Mineral riches: why here and not there? My historical tours in Butte always include geological background, including what, where, who, when, how, and how much. Among the most frequent questions from visitors is why—why did Butte (or any other big mining district) end up with so much copper and silver in a tight, 5-square-mile zone, and otherwise similar areas just a few miles away did not? My answer always is, “If I knew that, I could win the Nobel Prize in Economic Geology.” Not that there is such a prize, but you get the idea. 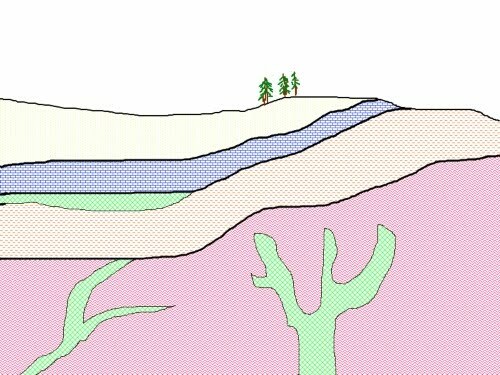 Geologists understand mineral deposits pretty thoroughly, up, down, sideways, and through time. But that ultimate question of “Why?” typically remains unclear. Why was there more tourmaline in western Turkey to put boron in hot water there, making Turkey the world leader in boron production? Why did a 45-million-year-old lake in southwestern Wyoming end up with enough highly concentrated sodium carbonate (a compound critical in glass making) to make that deposit the largest in the world? A good answer is challenging to find. We’re not totally clueless, of course. Researchers study primary mechanisms like black smokers on the sea floor, possible fundamental sources of deep-earth elements like copper, lead, and zinc. Such processes may represent the earth’s first version of mineral concentration. Later events, reasonably well understood, may take those primordial deposits and convert them into exploitable economic deposits in the earth’s crust, near enough to the surface for miners to work today. But “Why?” can be the hardest question to answer in geology, just as it may be in human affairs. In recent years, Saudi Arabia has been in a near-tie with Mexico for the #2 spot as a source of US oil imports. Late last year, Saudi Arabia dropped to fifth place. Good news, you say? Maybe. The forces moving oil around the world are complex, and in addition to recession-related decline in oil consumption in the US (mostly in diesel and jet fuel, not so much in gasoline), Saudi Arabia is shifting its market more toward China. This matters, because as exporters find markets willing to pay higher prices, those prices will increase in the United States as well, even if we are buying less. And as exporters begin to care less about the economic stability of their lower-demand customers, what the U.S. says about the question becomes increasingly irrelevant. Believe it or not, Saudi Arabia has had a vested interest in keeping oil prices low enough to keep the economic engine of the U.S. purring. Gouging is not in their interest—contented, spending customers are. When other customers supply most of the money any exporter needs, those who are lower on the totem pole become second-rate, at least as far as price concerns go. The next tier of import sources vary from month to month, but each of the following nations supplies the U.S. with about 3% to 4% of our oil imports: Angola, Iraq, Algeria, and Russia. Virtually every drop of Canadian oil exported comes to the United States. So don’t think we can simply “get more” from Canada. There is no more to give, except as Canadian supplies slowly grow. With prices as low as they are ($78 or so per barrel), the Canadian Tar Sands are barely economic, or non-economic, to produce. Which means they are not produced. I love to read letters to the editor whose writers seem to believe that all our problems (or at least those of the auto industry) could be solved by Americans buying American cars. I’m not going to get into the question of what’s an “American Car Company” – are Toyotas made in Tennessee American or Japanese? Does Daimler’s former ownership of Chrysler mean that they made foreign cars? Who owns Saab? I have no idea. I want to share some information about the sources of raw materials that make up the “American” car. Iron to make steel – far and away the greatest proportion, by weight, of every U.S.-made car – comes from mines in Minnesota and Michigan. 240 pounds of aluminum comes from either recycling or imported ores and concentrates, because the U.S. has no domestic production of bauxite, the only ore of aluminum. Smaller in volume, other elements are nonetheless critical components of modern vehicles. Copper – on average, a third imported from Chile, Canada, Peru. Gold – U.S. is a net exporter. Nevada is the leading producing state. 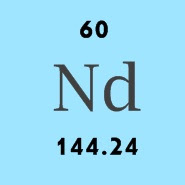 Neodymium – 100% dependent. China produces almost all in the world. There’s more, but that’ll do for this post. Are you saying, “I really don’t care whether my car has neodymium and lithium or not.”? You should. As gasoline prices increase, those and other elements will become dramatically more important in electric batteries and in improving fuel efficiency. Do you like your car’s glossy paint? Barium from China contributes to that sheen. Platinum and palladium make your catalytic converter work. Geologists are all about analogs. Since we don’t have actual time machines, we have to look at modern situations to project into the past and determine what happened. In a previous post I mentioned gypsum in Oklahoma, precipitating out of seawater on a hot, arid equatorial coastline 255 million years ago. A good modern analog for this is Umm Sa'id Sabkha, on the east coast of Qatar along the Persian Gulf (or Arabian Gulf if you prefer), in the photo below. A sabkha (Arabic for salt flat) is a low-lying area occasionally inundated by marine water. When the water withdraws, mineral salts precipitate as the water evaporates. Sabkas are the basis for our understanding of how many ancient deposits of evaporite minerals formed, including salt (halite), gypsum (used in wallboard), and sylvite (a source of potash for fertilizer, mined in New Mexico and imported from Canada and Belarus). Another analog: We’ve only known about black smokers (photo, left) since 1977. 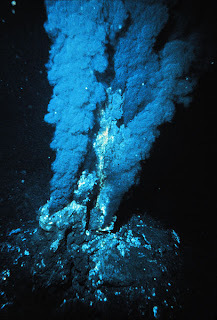 These hydrothermal vents on the abyssal sea floor spew superheated, metal-rich water into the ocean. Metal sulfides precipitate around the vents and provide a possible analog for ancient copper, lead, and zinc deposits exploited on land today. Deep mantle sources may be the origin of some metal concentrations in the crust. Lots of mineral deposits can’t be explained by direct analogs—for example, we can’t really look at the roots of a modern volcano to observe the processes that may be concentrating ores there. But inferences from modern situations are probably the best way we have of understanding unusual mineral bodies and predicting where to find more. “The present is the key to the past” – a concept first clearly expressed by Scottish geologist James Hutton in 1795 (but probably not in those exact words). Who’s got the oil in the US? Perhaps it’ll surprise you to learn that thirty-one states have at least a little oil production. That leaves 19 with none at all. In most states with no oil production, there’s also little or no oil potential, just because the rocks there lack the properties for generating and trapping oil. From the list below of non-producing states, those with some potential include most of the southern Atlantic seaboard – Georgia, South Carolina, and North Carolina. Oil accumulations may exist in sedimentary troughs in those states, as well as offshore, but exploration to date is not encouraging, so we’d call the potential pretty low there. Volcanic rocks cover much of Washington and Oregon. That doesn’t make oil pools impossible, but the likelihood declines greatly. Most of Minnesota and Wisconsin are underlain by ancient rocks, a billion years and more old, from a time when life was limited mostly to single-celled organisms. 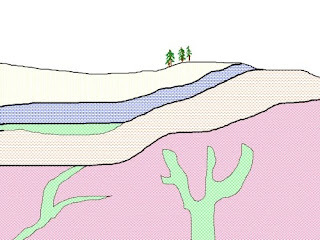 You need teeming life to make petroleum, and even though much oil derives from single-celled life like algae, the amount of life a billion years ago was not enough to make oil – or if it did, it has not survived collisions, subductions, and other traumas the earth has thrown at the older rocks of Wisconsin. The younger rocks there are relatively thin, another factor reducing the potential for commercial oil fields. You need to bury organic material deeply to naturally cook it into oil, but not so deep as to overcook it. So 31 states are awash in oil, getting rich on production taxes and severance taxes. Well, not quite. Almost 80% of US oil production comes from just four states. For November 2009 (data from World Oil), the four leading states in descending order were Louisiana, Texas, Alaska, and California. The other 27 producing states together account for just over 22% of total US oil. Connecticut, Delaware, Georgia, Hawaii, Idaho, Iowa, Maine, Maryland, Massachusetts, Minnesota, New Hampshire, New Jersey, North Carolina, Oregon, Rhode Island, South Carolina, Vermont, Washington, and Wisconsin. 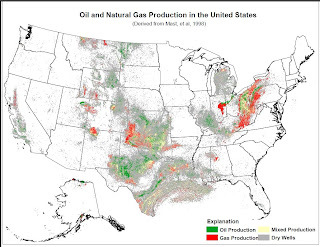 The map below, from the US Geological Survey, shows most of the wells in the US – more than 500,000 producing oil wells (over half the oil wells on earth), plus gas wells and dry holes. Some estimates figure three to five million wells have been drilled in the US in the search for oil and gas. Fluorine is another relatively obscure element, but one virtually every American has in his or her home. 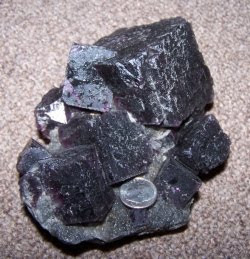 Fluorine gas derives mostly from the mineral fluorite—a beautiful mineral, prized by collectors for its multicolored cubic crystals. The Cave-in-Rock District, along the Ohio River in southern Illinois, once produced most of the world’s fluorite (also known as fluorspar). Those mines are closed now, and the U.S. is dependent on imports for 100% of the fluorspar that we consume, amounting to more than 400,000 tons each year. Where does it go? Most fluorine goes to make hydrofluoric acid, critical in aluminum and uranium processing. And hydrofluoric acid is the feedstock for all fluorine-bearing chemicals, and this is where fluorine ends up in homes. Teflon in non-stick cookware and Freon in air-conditioning systems are brand names for fluorinated compounds. Then there’s fluoride in toothpaste and municipal water systems, not as a communist plot but to alleviate tooth decay because fluorine in the crystal structure of calcium phosphate (the mineral making bones and teeth) is stronger than otherwise. Enamel coating your stove almost certainly contains fluorine. Glass and steel manufacture demand it, as does cement production. Where does the U.S. get fluorspar? Most imports (52% in recent years) come from world production leader China. Another 34% is imported from Mexico, with South Africa a distant third as a U.S. fluorspar supplier. This probably doesn’t apply to me, but just in case. The Federal Trade Commission requires bloggers to disclose any freebies or promotions they get in connection with any products they discuss. No one gives me anything. Well, sometimes a friend of relative does, but I’m not endorsing them, either. I don’t get any kickbacks from the government of China for describing the Bayan Obo rare-earth deposit. Toyota isn’t breaking down my garage door to give me a Prius because I talk about the neodymium in its motor or the lithium in its battery. In case that should happen, I’ll be very happy to disclose the fact. My goal is to be objective anyway, so if a company gave me a freebie, that wouldn’t guarantee much, anyhow. How many nations do you depend on when you toast your morning bread? My cheap $15 toaster’s case is mostly galvanized (zinc-coated) steel, with white exterior surfaces thanks to a thin enamel covering. Common traditional toasters, many still in service, are chrome-plated steel. The ends of mine are white plastic with red lettering. The bread rack inside is also chrome- or nickel-plated steel, although in mine there’s also an aluminum support system. Stainless-steel (a chromium-iron alloy) screws and rivets hold the whole thing together. A nickel-chromium alloy, in strips wrapped around a mica sheet or mica-paper board, does the work. Nickel-chromium has high electrical resistance—it doesn’t conduct electricity well, so when a current flows through it, it gets hot. Differential thermal conductivity comes into play again, in the thermostat, which may be a simple bi-metallic strip (usually steel and copper). The two metals heat up at different rates, forcing the strip to bend. This action in turn effectively flips a switch to turn off the heat and release the rack so it pops up. The wire that leads to the electric outlet is copper, insulated by flexible plastic. Some of the raw materials that make the toaster come from domestic mining, but the U.S. depends on imports for most of the materials. Iron ore – U.S. just about breaks even: a small exporter some years, a small importer in other years. We’ll save the bread itself, together with the electricity to run the toaster, for future posts. So how many countries in your toaster? Canada, India, South Africa, Russia, Norway, Mexico, Kazakhstan, Chile, China, Jamaica and the U.S. – eleven countries at a minimum. Photo by Donovan Govan, used under the GNU Free Documentation License. Perhaps your family heirloom cutlery is sterling silver (that is, 92.5% by weight silver and 7.5% copper), but most likely your “silverware” consists of stainless steel. Stainless steel has been around for only about 100 years, although chromium’s corrosion resistance in iron alloys was known by the 1820s. In the 1910s metallurgists invented ways of reducing chromium’s carbon content to make commercial stainless steel possible. Chromium makes steel “stainless,” not literally true, but such alloys are far less likely to rust. Chromium finds its greatest use in stainless steel alloys, but dinnerware represents a tiny portion of end use. Structural elements in cars, aircraft, and appliances, together with building construction, take huge volumes of stainless steel. Most stainless steel alloys contain 10% or more chromium, with iron proportions at 70% to 90%. While iron and chromium dominate the chemistry of stainless steel, your knife or fork probably contains other metals that make the alloy more machinable, resistant to abrasion, or simply more shiny. Nickel, manganese, molybdenum, titanium, and aluminum all contribute desirable properties to stainless steel. Dinnerware alloys commonly contain nickel (10%) and chromium (18%) combined with iron (72%). Nickel makes the alloy stronger, and chromium increases hardness along with its corrosion resistance. The U.S. has no primary chromite (iron-magnesium chromate, (Fe,Mg) Cr2O4, chromium’s principal ore) production from mines, but our import dependency is only 39% thanks to a remarkable 61% of supply generated by recycling. Imports come mainly from South Africa and Kazakhstan, which together with India produce three-quarters of the world’s chromium—one of few elements whose production isn’t dominated by China. Chromium metal hit record prices in 2008, averaging $11,078 per ton. U.S chromium consumption is declining with the recession, but in 2008 we used more than 400,000 tons worth more than $1 billion. With prices like that, it’s no surprise that one chromite deposit about 10 miles south of Coos Bay, Oregon, is being evaluated and permitting is in the works. Additional chromite reserves exist in the 2.7-billion-year-old Stillwater Complex of south-central Montana. I think scientists generally put lots of “ofs” in their writing. At least I do. I know it, I hate it, and I still do it. Combined with the discovery of the vast copper resources of Chile, this spelled the beginning of the demise of the copper business of the United States. But at least overuse of “of” can be repaired. Or maybe I should lose the “ofs” and say “I can overcome this problem.” Sometimes. I’m prone to happily split an infinitive here and there, and I agree with Winston Churchill’s lines ending in prepositions, at least occasionally. 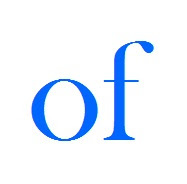 And “of” is a useful and necessary word. I’m just trying aggressively to improve my writing by controlling its unchecked spread. I hope you like the revised sentence about Chile’s copper. It may not be perfect, but at least it’s a little better, I think! Combined with vast copper discoveries in Chile, decreased demand drove the U.S. copper industry into a long, generally downward spiral. I live in a mining town. In some ways, the mother of all mining towns—the richest hill on earth, literally, and the only mining camp in the United States that grew into a multi-ethnic metropolis, with close to 100,000 people ninety years ago. In Butte, Montana, gold drew them, silver kept them, and copper made them rich. When I look out my kitchen window I see a little park, the site of a small mine that shut down in 1910. Its waste rock makes the walls of my basement. And I see a massive headframe, the surface expression of the Anselmo Mine, one that reached 4,301 feet deep and closed in 1959. I’ve met Ed Panisko, a gentle man and a tough miner, the previous resident of my house, who worked in the Anselmo. What Things Are Made Of didn’t come about because of my living in Butte. It started when I lived in Golden, Colorado, and was mostly an intellectual outgrowth of the perpetual calendar, History of the Earth, created in 1994. But Butte and its people have absolutely fostered and stimulated my work on What Things Are Made Of—in many ways, the core concepts of that book are nowadays right outside my door and in the foreground of my mind as I live and write and walk Butte’s streets. Mining towns are complex, because they draw a transient population that depends on the vagaries of the mining business. Mineral commodities depend on all the things that drive the world economy. Wars are good (more copper, more iron, more manganese). 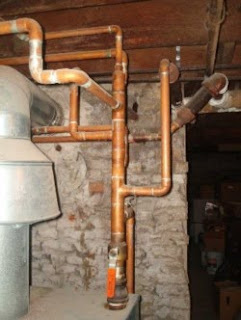 Housing booms are good (copper pipes for plumbing) and busts are not (less gypsum for sheetrock, less feldspar for toilets). New inventions that connect and help humans are good (copper wires for telephone lines, tungsten for incandescent light filaments, mercury for Dr. Rush’s Thunderclappers, neodymium for electric car batteries). And so go the fortunes of places like Butte or Chuquicamata or Almaden or Bayan Obo or Udachnaya. Living in a historically vibrant mining town that today is part of the nation’s largest Superfund site (as well as the nation’s largest National Historic Landmark district) is a huge eye-opener for anyone who is conscious of both the needs for mineral resources and the damage their extraction can create. And, I hope, of the possible ways that damage can indeed be remediated. The Clark Fork Watershed Education Program exploits the historical needs, the damage, and the ongoing restoration, to foster understanding and stewardship in a complex environment. I’m quite proud to have an occasional small role in that organization’s outreach to thousands of K-12 students and teachers. In Butte, I live at the corner of Quartz and Crystal Streets, a very cool spot for a geologist. That’s one of the aspects of Butte that contributes subliminally to What Things Are Made Of. I’m a person who craves the frontier. I grew up at a time when the American frontier had evaporated: I tried California’s golden magnet, but the frontier was gone. Space might have worked, but I wasn’t able to be an astronaut. Butte’s history, its color, its intricate flavor, is my personal frontier now. It touches all I do. Before you read on, take a guess. What non-fuel mineral commodity adds up to the most valuable mineral industry in the United States? “Non-fuel mineral commodity” means minerals, metals, rocks, natural mineral-rich solutions, stuff taken from the earth other than oil, natural gas, and coal. And not water. Here’s a hint: it’s not iron ore, not lead, not gold. It’s not silver, aluminum, or copper. The most valuable mineral commodity was worth more than $13 billion in the U.S. in 2008, but its average price was just $8.98 for a ton. We used almost 1½ billion tons of this common stuff, and had to import a bit (just 2%) of what we used, mostly from Canada, Mexico, and the Bahamas. Every state produces it, from more than 4,000 sites operated by more than 1,600 companies employing more than 80,000 workers. Texas, Pennsylvania, and Missouri are the top three producing states. This most valuable material declined in use by a third from 2006 to 2009, a statistic that may suggest that its uses relate to factors affected by the recession. Indeed, the greatest use reported for the commodity is in construction, mostly road construction and repair. What is it? Crushed stone. A 462,000-gallon oil spill such as the one near Port Arthur, Texas, in January 2010 is not a good thing. But it gives a good opportunity for some perspective. 462,000 gallons amounts to not quite one minute’s worth of oil consumption for the United States. As of October 2009, we used up (forever) 546,204 gallons every minute of every day (EIA data), and that's with US consumption down by 2 million barrels a day or so from 2007, thanks to the recession. In terms of world oil consumption, this spill represents just over 11 seconds in the planet’s oil-guzzling day. You all know what uranium is used for: nuclear weapons and nuclear power. Some volumetrically tiny but nonetheless important uses include x-ray generators, inertial guidance systems, glass coloring agents, and age-dating in geology. The mystique of secrecy and national security surrounding uranium and its products might lead you to think the United States produces—and jealously guards—all that we need. Nope. Although the U.S. is the consumption leader, using 30% to 40% of world uranium in recent years, U.S. production totals only about 3% of world supply. In 2008, 85% of U.S. uranium consumption was imported, an import dependency greater than that for oil. Canada extracts the most uranium of any country, and has the greatest known reserves. Australia is second-place producer, with Kazakhstan, Niger, and Russia in a near-tie for third place. Kazakhstan is second in reserves. The U.S. imports uranium from Canada, Australia, Russia, Kazakhstan, Namibia, Uzbekistan, South Africa, and elsewhere. Economic viability of uranium mines in the U.S. depends sensitively on the price. Wyoming and New Mexico together have some 700 million pounds of uranium reserves if the price is $50 per pound, but only around 175 million pounds at $30 per pound. In January 2010 the price was $44.50 per pound, but uranium prices from 2004 to 2007 fluctuated widely, from $15 to $138 per pound. Volatile prices are the bane of the mining industry, which requires long lead times, huge up-front investment, and complex infrastructure. 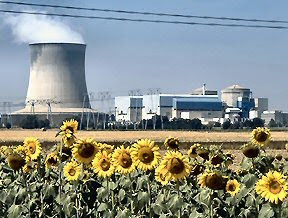 Nuclear power plant image from Wikipedia. Countries like the US, Russia, China, Canada, Brazil, and Australia are relatively rich in a wide variety of mineral resources for a simple reason: they’re big. Big enough to have a lot of geology, a lot of environments, a lot of situations where economic mineral deposits can accumulate. Small countries just don’t have the geologic diversity to be rich in lots of minerals—but lucky geologic accidents do occur, sometimes making a small country the world leader in one or two commodities. For example, Spain and Italy together account for two-thirds of the world’s reserve base of mercury. Spain’s mercury mines were among the oldest mines of any type in continual operation (since Roman times) when they ceased mining in 2003 because of decreasing demand for mercury. Pumice, a volcanic rock used in building-block construction, spews from volcanoes all over the world, but Greece produces more commercial pumice than any other nation. Finland produces more than a third of the world’s peat. The US imports nearly a million tons of peat annually for horticulture, but next-door Canada is the main supplier rather than Finland. Botswana’s miners find more gem diamonds than miners elsewhere, at 25 million carats per year, but Russia is a close second with 23 million per year. Botswana and adjacent parts of southern Africa harbor a disproportionate number of kimberlite pipes, unusual igneous rocks that transport diamonds from depths of 150 to 200 km beneath the surface—depths where pressures are great enough to squeeze carbon into diamonds. Boron—used in glass, ceramics, soap, detergent, bleach, enamel, and other everyday products—comes from many countries (and the US is a net exporter), but the world leader is Turkey. 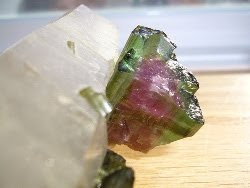 In western Turkey’s Menderes Massif unusual concentrations of tourmaline, a boron mineral that sometimes makes gemstones, give thermal waters their remarkable boron content. Recent faulting seems to provide pathways for the hot water, which serves as a geothermal resource as well as a reservoir for boron. Gem tourmaline photo from Wikipedia under GNU Free Documentation License. Virtually every home in America contains a great volume of one mineral: gypsum, the primary constituent of wallboard. Gypsum (chemically, calcium sulfate) crystallizes from supersaturated sea or lake water when the water evaporates, much like common salt precipitates from such water. In the United States, Oklahoma is the leading producer of gypsum—nearly 3,500,000 tons of it, worth more than $26 million in 2007. But wait, you say — Oklahoma is nowhere near an evaporating sea bed, or even a lake! True, but 255,000,000 years ago, Permian time, as dinosaurs were about to begin their long reign, western Oklahoma was indeed a shallow, restricted lagoon or arm of the sea, and the climate was arid along a shoreline not far from the equator. Evaporation happened. In Oklahoma’s Blaine Formation four to six gypsum layers, each as much as 10 feet thick, separate thin red shale beds. Shale solidifies from mud, and its red color reflects exposure to the atmosphere as evaporation proceeded: the iron in the mud oxidized to hematite—red iron oxide, essentially rust. In today’s arid Oklahoma, when groundwater dissolves ancient gypsum and re-deposits it, beautiful crystals form. Oklahoma’s official state crystal is selenite, a type of gypsum found most notably at Great Salt Plains State Park near Jet, a town in northwestern Oklahoma. After Oklahoma, U.S. gypsum production leaders are Arkansas, Iowa, California, Nevada, Texas, Indiana, and Michigan. But our total, nearly 13 million tons a year, can’t satisfy U.S. wallboard demand. Imports, mostly from Canada, Mexico, and Spain, account for more than 25% of US gypsum consumption. As with so many minerals, China leads the world with gypsum production more than triple that of the United States. Based on What Things Are Made Of, Chapter 1: All The Ships of the World. 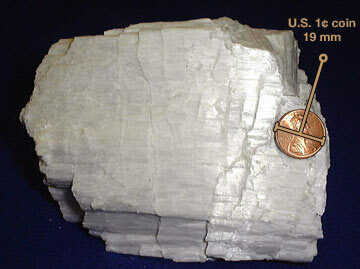 Public domain gypsum image via Wikipedia. The elephant in the room when it comes to resources is oil. What Things Are Made Of has a chapter on transportation, and oil is naturally a big part of it. The oil section of my web site has lots of statistics (if you type oil statistics into Google, I come up ahead of the Energy Information Administration!). Today I simply want to make a bullet list of a few interesting observations about oil. Data are from late 2009. The US gets about half its oil and petroleum products imports from the Western Hemisphere. Canada is our #1 supplier. In addition to crude oil at about 8.5 million barrels per day, the US imports about 1,000,000 barrels per day of gasoline (42 million gallons per day) and 2,000,000 barrels per day of other refined petroleum products such as diesel fuel. Only 1.2 gallons per 44 gallons of product made from a 42-gallon barrel of crude oil goes to make chemical feedstocks for plastics, paint, synthetic rubber, and petrochemicals. That’s not quite 3%. (While there may be good reasons for using less plastic, saving enough oil to make the USA oil independent is not one of them.) There’s an internet message going around that says it takes 12 million barrels of oil per year to make all the plastic bags we use. Not true—79% of North American plastic grocery bags are made from natural gas, not oil. Even if it were true, 12 million barrels a year is only 14 hours of total U.S. oil consumption out of the entire year. Platinum, palladium, the rare-earth elements lanthanum, neodymium, and praseodymium, an unusual clay mineral called halloysite, and natural and synthetic zeolites are among the mineral commodities needed in petroleum refining. America relies on imports for most of these materials: platinum from South Africa, palladium from Russia, rare earths from China. New Mexico supplies the greatest volume of natural zeolites, and one mine in Utah is the world’s largest known deposit of halloysite. The Middle East has something like half to two-thirds of all the oil in the world. Why? It takes several pages in the book to explain in detail, but the simple answer is a series of lucky accidents of geology. Enough for now—but oil will return to the blog in the future! Public domain pumpjack image via Wikipedia. If you find the topics in this blog interesting, I’d also refer you to two important resources. Earth Magazine (formerly Geotimes) is a publication of the American Geological Institute. Although it is a trade magazine aimed at geoscientists, its articles are highly readable and informative. There’s a feature called “Mineral Resource of the Month” usually written by mineral commodity specialists with the U.S. Geological Survey. My goal with What Things Are Made Of is to connect the chromium in your stainless-steel fork to its geological origins, its role in history, and its place in a complex, global network of interdependent producers and consumers. And to try to do that for hundreds of things around us every day. I monitor various news, geology, and materials sources for hot topics to include in What Things Are Made Of. My latest discovery is a wonderful compound, copper indium gallium diselenide, with the unfortunate acronym CIGS. Indium, gallium, and selenium often combine to generate light when electricity flows through them—variations on that list, often including arsenic, power lots of LEDs (light-emitting diodes) in all sorts of products from hand-held calculators to traffic signal lights. Dow Chemical in Midland, Michigan, announced their brand of CIGS solar panels last October. They aren’t your traditional solar panels—these are thin films encased in plastic that can be embedded in asphalt shingles. Roofing contractors can install them—no need for specialized solar technicians. No offense to solar technicians, but this should make the panels cheaper to install. Dow hasn’t said what they’ll cost, but they should be on the market by mid-2010. Indium forms few minerals, and most indium is a byproduct of zinc smelting. Indium supply follows the ups and downs of the zinc industry, which in turn depends largely on large-scale steel galvanizing. Industrialization in China and India, calling for more and more galvanized (zinc-coated) steel communication towers and highway barrier systems, isn’t the controlling factor behind zinc consumption, but it is an important aspect of it. China leads the world in indium production, and also leads in supplying imports to the United States which is 100% dependent on foreign sources for indium. Likewise, virtually all gallium used in the U.S. is imported, in almost equal proportions from China, Ukraine, Germany, and Canada. Processing bauxite to produce aluminum yields most of the world’s gallium. Selenium is also a byproduct, usually of copper refining. One refinery, ASARCO’s 11-acre building near Amarillo, Texas, produces all primary domestic selenium, but the U.S. also imports nearly 600 tons per year, mostly from copper refineries in Belgium. Some estimates suggest that indium demand could increase ten-fold over the next five years because of increased CIGS solar panel usage. If that happens, look to China for supplies—China produces 58% of the world’s indium, far ahead of #2 Japan (11%). You don’t care about solar cells? 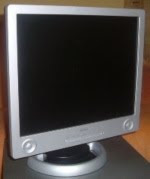 How about your flat-panel TV, computer screen, iPod, and other display devices? They all require indium. Flat-panel image from Wikipedia, under GNU Free Documentation License. A friend questioned the quiz answer indicating that the U.S. is 100% dependent on imports for bauxite (photo, right), the only ore of aluminum. He knew that lots of minerals contain aluminum—it’s the third most abundant element in the earth’s crust, after oxygen and silicon. And the rock-forming minerals that contain aluminum are common, ranging from feldspars in granite to clays in fine-grained shale. So why can’t the U.S. use those aluminum sources, rather than relying 100% on bauxite imports from Jamaica, Guinea, Brazil, Guyana, China, Sierra Leone, and Greece? The simple answer: It’s far too energy-demanding to get the aluminum out of any rock other than bauxite. Despite aluminum’s abundance, aluminum metal was not isolated until 1825, by Danish chemist Hans Christian Oersted—the discoverer of the close relationship between electricity and magnetic fields. It was an electric current that allowed Oersted to produce impure metallic aluminum, but aluminum remained a rare and expensive curiosity for 60 years. Charles Hall, a student at Oberlin College (Ohio) devised the first relatively cheap electrolytic aluminum manufacturing process in 1886—and the Aluminum Company of America treasured as “crown jewels” the small metal buttons Hall made. Aluminum is bound tightly, usually with silicon, in common minerals. Only a few minerals lend themselves to the electrical disruption needed to free aluminum metal from the crystal lattices. 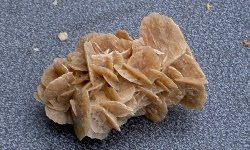 Three aluminum hydroxide minerals, gibbsite, boehmite, and diaspore, are in that category, and they are the primary components of the rock bauxite. Bauxite forms by intense chemical weathering of aluminous minerals like feldspar in granite—in fact, Mother Nature does most of the work of producing aluminum, rearranging aluminum atoms to make bauxite’s hydroxides. Metallurgists seeking pure aluminum can process bauxite cheaply, while the aluminum in more common compounds like feldspar and clay is impossible to remove commercially. In the United States, the only significant bauxite formed 90 million years ago in what is now Arkansas. Those deposits served as important ore sources from 1899 until competition from cheaper foreign markets and recycling ended production in 1990. The U.S. has no primary bauxite production today. No bauxite doesn’t mean we don’t produce a lot of aluminum. With 30% recycling, together with processed imports, the United States in 2008 was a net aluminum exporter—a dramatic change from 2005 when metallic aluminum was imported (more than 40% of domestic consumption) along with 100% imported bauxite. U.S. aluminum smelters employ 55,000 workers in an industry whose metal production earns $7.9 billion each year. As Jules Verne wrote, “Aluminum was once a precious metal.” Precious enough to cap the pyramid atop the Washington Monument in 1884, when aluminum’s price was $1 per ounce, the same as silver—at a time when a dollar bought nearly 500 pounds of coal, 150 bricks, or 15 pounds of flour. Adapted and expanded from What Things Are Made Of, Chapter 4: You Are What You Eat. 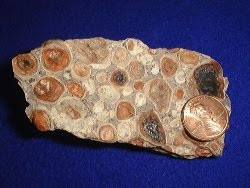 Bauxite image above from USGS via Wikipedia. Many people I talk to have the mistaken impression that the United States is not only self-sufficient in most resources (with the generally known exception of oil), but that we are also the world’s 600-pound gorilla when it comes to most of the important natural resources we use. Not so. In the list below, I’m focusing only on some of the main mineral resources, things that are familiar to most people. For each commodity, I’m providing the world production leader (in some cases, a very close #2 is also given) with the percentage of world mine or factory production that nation contributes, using 2008 figures from the US Geological Survey. U.S. percentage and world rank is given for comparison. For most of these resources, the U.S. consumes far more than it produces. My point is simple: Isolationist attitudes about natural resources are untenable. Modern society, especially in the United States, relies on a thoroughly globalized interdependency—whether we like it or not.